Base of Operations: Mobile across the United States, although he prefers New York. Powers/Abilities: Cassidy is a fairly standard vampire. He drinks blood, the sun burns him, and he doesn't age. He heals from virtually any wound so long as he can get some blood to drink, has incredible strength, and can't be killed by regular weapons (although they do hurt him). 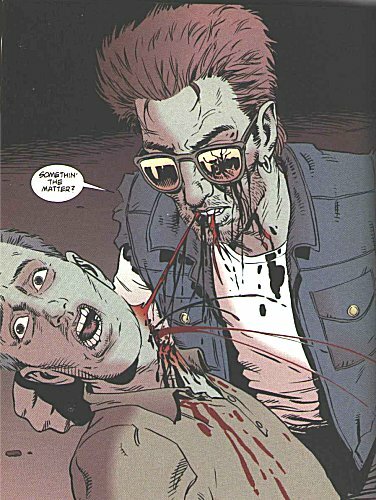 Unlike "standard" vampires, holy objects don't bother him (in spite of the fact that there is most definitely a God in the Preacher universe). He can't fly either, and hasn't displayed any sign of shapeshifting, so it's fair to say he probably doesn't have that ability. He can also breathe underwater, which is one potential haven from the sun during the day. History: Cassidy was born in Dublin at the start of the Twentieth century. Like many of his generation he grew up with a dislike of British rule, and when the Easter Rising of 1916 started, he joined the rebels. His brother William dragged him out by force before the troops captured those taking part in the uprising, and together they attempted to flee Dublin. Stopping to rest by the banks of the river Liffey, Proinsias was attacked by a rotting thing which emerged from the water. William shot at it, driving it away, but not before it grabbed his sibling and dragged him into the river with it. Proinsias was shocked when he awoke the next day to discover he wasn't dead ... or so he thought. Emerging from the water he swiftly learned that the sun's rays now burned him. He had become a vampire. Realising it would be difficult to hide his new lifestyle in a country as small as Ireland, Cassidy took passage on a ship bound for New York. While he loved his new home, he would periodically move away to avoid watching his friends growing old and dying around him. After decades of this lifestyle he encountered Jesse Custer, a Preacher literally touched by the power of God, and they became close friends ... although Cassidy severely tested this friendship by sleeping with Jesse's girlfriend Tulip. Thanks to Hugh Platt for correcting me on a couple of points regarding Cassidy's vampiric abilities. He noted that "In the Preacher Special: Blood and Whiskey, Cassidy meets Eccarius, another vampire. There he takes him into a church and berates him for acting like a Lestat-wannabe, showing him there's nothing to fear from religious imagery. They also laugh when Eccarius recollects trying to fly by jumping off a building and breaking "both my f***ing legs"."